Marcia Willman is a painter and a CFCA sponsor and employee. Her love for her two sponsored friends is evident because she positively lights up when she talks about them. She is passionate about helping them so she used her creativity to extend beyond the canvas by selling her paintings to raise money to help her two friends. Marcia’s story was featured on KMBC-TV, a local Kansas City news station. Paige Shortal sent a message about her sponsorship experience to members of her parish and then prepared a presentation during a Thanksgiving Mass. “Angel Lady” Debra Dryja uses the profits from her craft sales to pay for her sponsorship of Regine, a girl living in the Philippines. Hunter Hardin wore a CFCA jersey when he competed in an Ironman triathlon. He asked friends and family to support his effort and raised enough money to sponsor an older student. 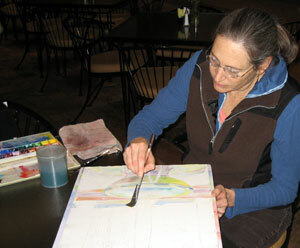 Watercolor artist Joy Helfrich promotes CFCA at his art shows through various brochures and printed publications. Ted Dauphin sets up displays at county fairs, city events and other similar activities. Helen Stevens takes CFCA brochures with her during her frequent travels and drops them off at Catholic churches. These are just some of the ones we know about! Thanks to all our CFCA fans who share this organization with others. Leave a comment below with your own experiences — we’d love to hear your stories and ideas to help spread the word of CFCA. Thanks for the fantastic info – I loved reading it! I always love looking at this blog If God is watching us, the least we can do is be entertaining. now i find something that i want to know..